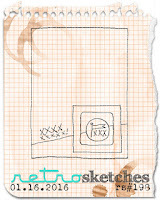 I've just got one card to share today for the current RetroSketches challenge. Another Valentine card to add to my ever growing stash. I don't think I've ever been so prepared for a card giving occasion before! This one uses Reverse Confetti stamps, Sweet Stamp Shop and Mama Elephant dies and some Simple Stories paper. It came together really quickly which doesn't happen very often. The bee is fussy cut and popped up and he and the heart both have a lick of clear Wink of Stella on them. That's it for now. See you tomorrow with two more cards! This is too cute. Love that sweet little heart. 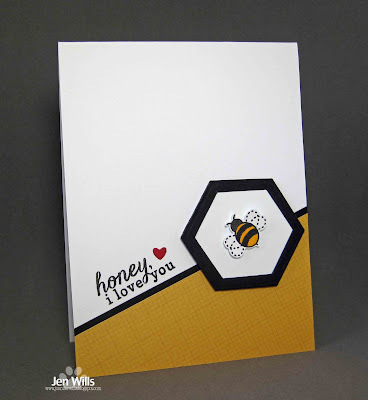 I love the sweet bee and great use of the sketch Jen! Somebody will be buzzing and humming with joy when this darling honeybee lands in their mailbox! I like that he's a bit 'chubby'; makes me smile! Yayyy you for daily posting! Carry on; you brighten my day exponentially! Oh so sweet, Jen ... seriously amazing! This is so... sweet! It's a perfect non-traditional valentine. 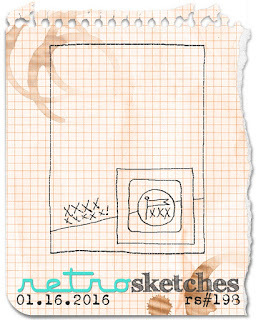 Great interpretation of the sketch, Jen, and so cute. This is fantastic, Jen!! I love the little bee and the paper you used to complement it. It looks like a huge honeycomb - so perfect for the bee theme. Hope it's a little warmer for you today and that Tex got some sunshine today. Temps dropped a bit here so Lexi nudged her way under the electric throw tonight. 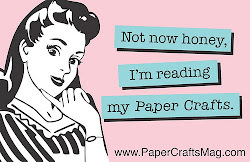 :) Can't wait to see what you have to share tomorrow!